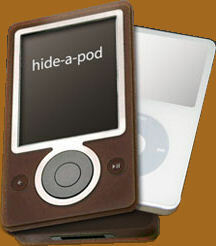 While we are at the topic of the iPod: Face it, the iPod has become a target for theft. So how can you take your iPod out of your home without fear? Just tell us what iPod model you want to protect and we provide a gutted and hinged Zune with our custom molded iPod casing adapter. Now iPhone Ready! Sorry, only brown Zunes are available for the maximum anti-theft protection.